WhatsApp is experimenting GUI through renewing emoji style. Recently they added animated GIF sharing, quick forward button, GIF keyboard, etc. 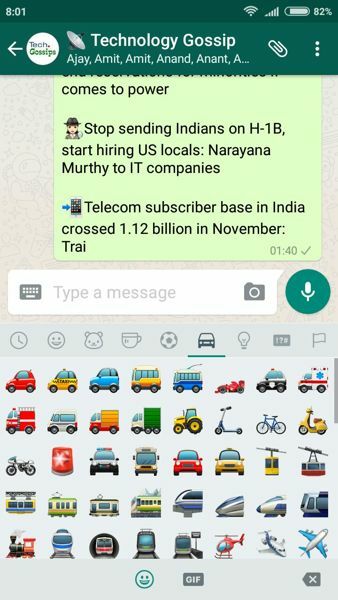 Now WhatsApp beta 2.17.43 version brings new emoji style. They switched emoji style to 2D versus previous flat style. It will soon available to all user once it coming out from beta stage. Some rumours also coming like WhatsApp introducing self-disposable image, messages. Messaging in future could be editable before it gets read-tag. As a word-leader, it has challenges to improve the user experience without hampering the performance for which they are well-known. If you look at current interface fashion then it has adhered to flat style standard. For example, most apps came in flat interface including menu, icon, etc. But they challenging the status quo and diverted itself into a two-dimensional world. The current emoji experiment is evidence for it. Post acquisition by Facebook, they bring up the web-view, voice call, video call, backup to the cloud via Google Drive, etc. Which was one of a milestone of their journey.